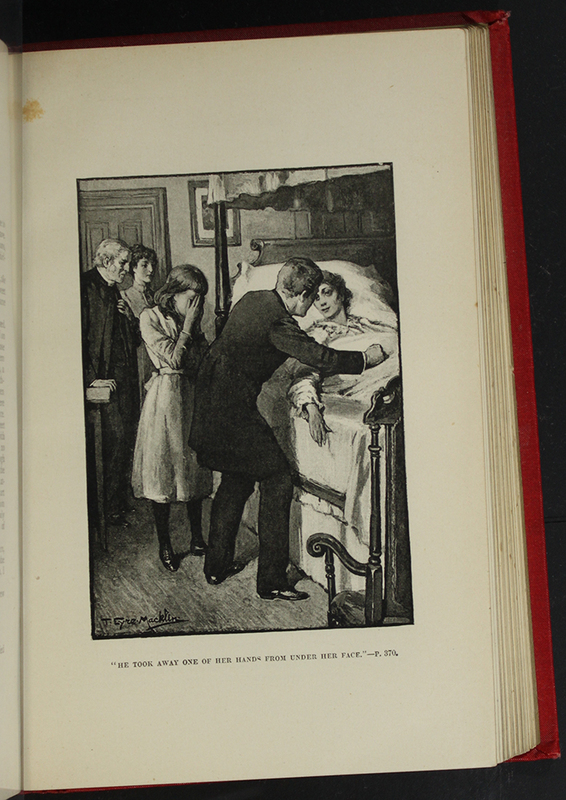 This black and white illustration appearing on page 438, of the 1892 J.B. Lippincott "New Edition", depicts Alice's death bed, with Ellen weeping next to her. Alice's face is pale and serene, her eyes are open, and her right hand is lifted up as if to comfort Ellen. Ellen holds her left hand, while she covers her grief-stricken, shadowed face with her right hand. 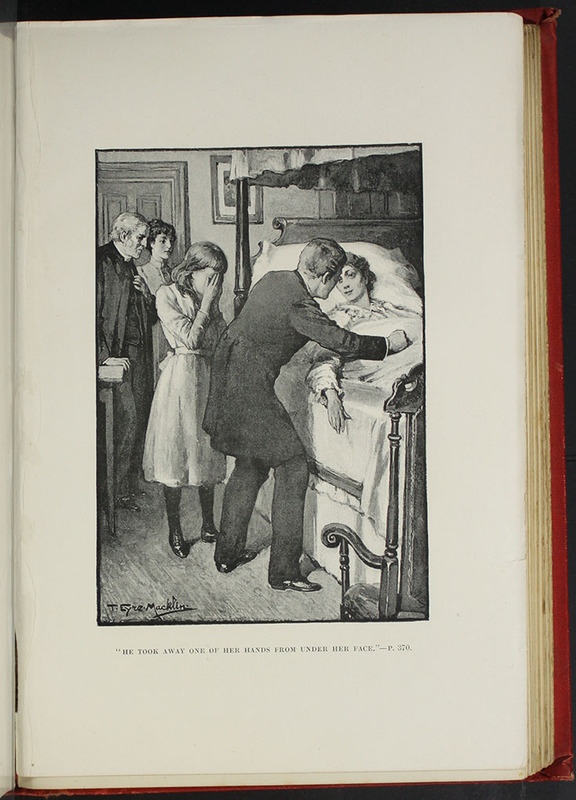 This illustration, appearing on page 212a of the  George Routledge and Sons edition, depicts a pale Ellen, sick in bed, as she kisses Mr. Van Brunt's hand. Mr. Van Brunt, dressed in a long green coat and pants with a buttoned orange shirt, stands next to Ellen's bed holding a hymn book in one hand as Ellen kisses the other. A caption below the illustration quotes a short passage from page 212. The illustration embodies the ideas of sentimentalism, which utilizes emotion to affect ideas of morality. Ellen, who has just expressed her desire for Mr. Van Brunt to become one of the "fold of Christ's people," appeals to Mr. Van Brunt (and the viewer of the illustration) through a display of emotional affection. The presence of the hymn book foreshadows Mr. Van Brunt's eventual devotion to Christianity. This is the illustration on page 192a of the 1853 H.G. 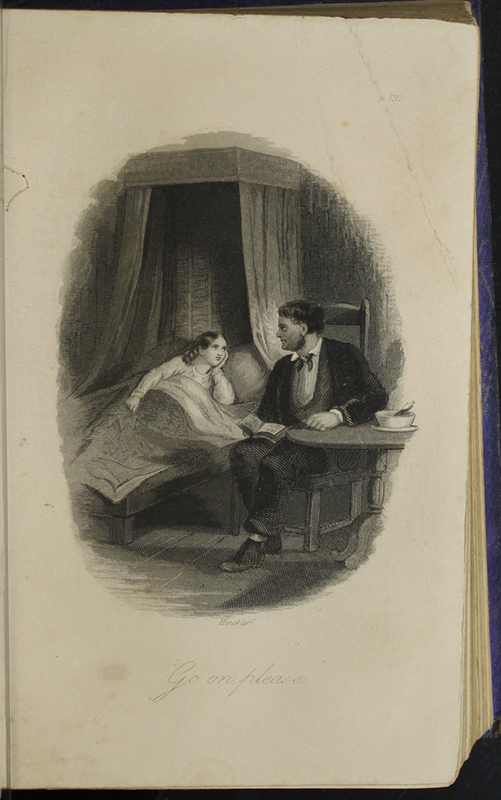 Bohn Reprint, Version 2 Depicting Mr. Van Brunt reading to Ellen at her sickbed. 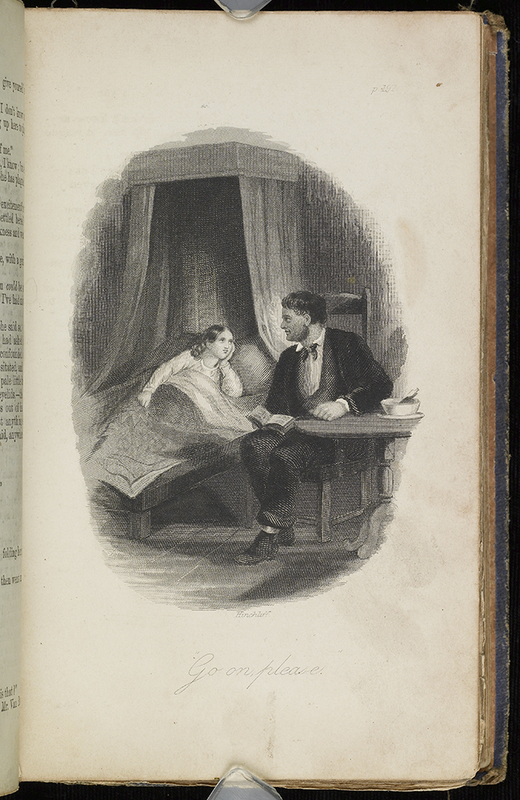 This black and white image depicts Ellen lying in her sick bed as Mr. Van Brunt reads to her from her hymn book. Mr. Van Brunt sits at a table, across from the bed, but is turned completely toward Ellen. Ellen is sitting up in bed, her head resting in her hand, as she looks at Mr. Van Brunt. The title of the illusration is "Go on, please". 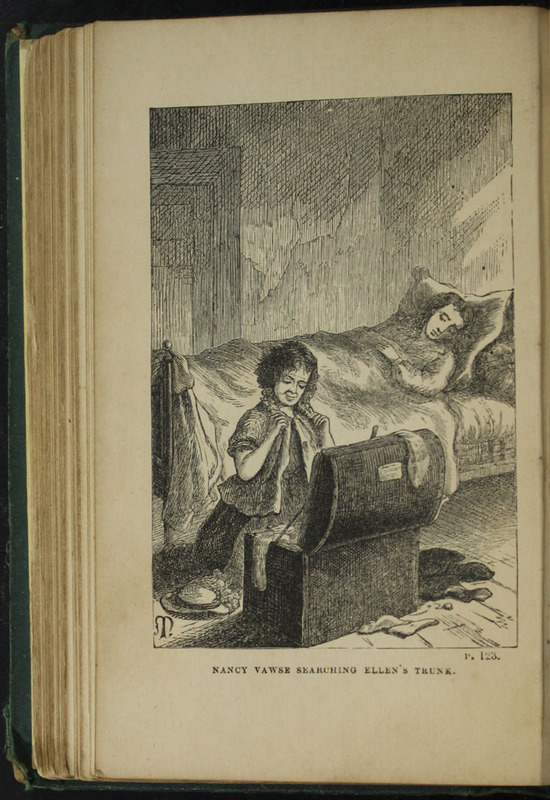 This black and white illustration from the 1879 Milner & Sowerby Reprint, page 122b depicts Nancy taunting Ellen at her sick bed. The scene is from page 123 where Nancy is on the floor, rummaging through Ellen's trunk, trying on her things, Ellen's clothing scattered across the floor. The bottom of the image is the title "Nancy Vawse Searching Ellen's Trunk". The page number for the scene is at the bottom right corner of the illustration. 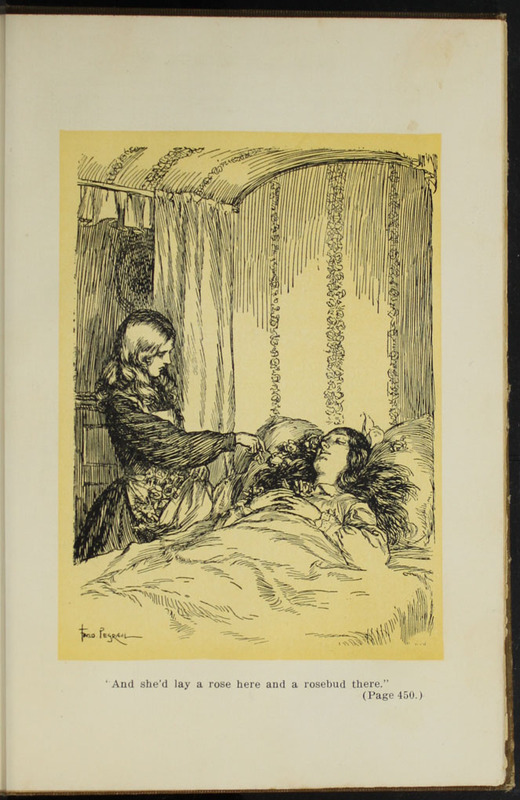 This black and white illustration on page 368b of the  Walter Scott, Ltd. "Complete Edition" reprint, depicts Ellen, Margery, and the Humphreys grieving Alice's deathbed. 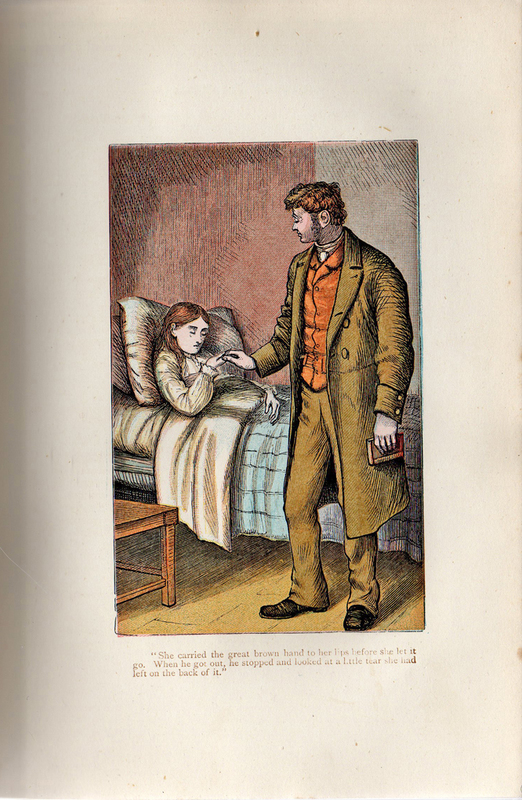 In the illustration, Alice is laying in bed, looking at John as leans over and places a hand on her as Ellen stands behind him, face in her hands. Mr. Humphreys and Margery stand by the door behind Ellen. A caption below the illustration reads, "He took away one of her hands from under her face." The scene depicted in this illustration is on page 370 of the novel. This is the illustration on page 192b of the 1853 H.G. 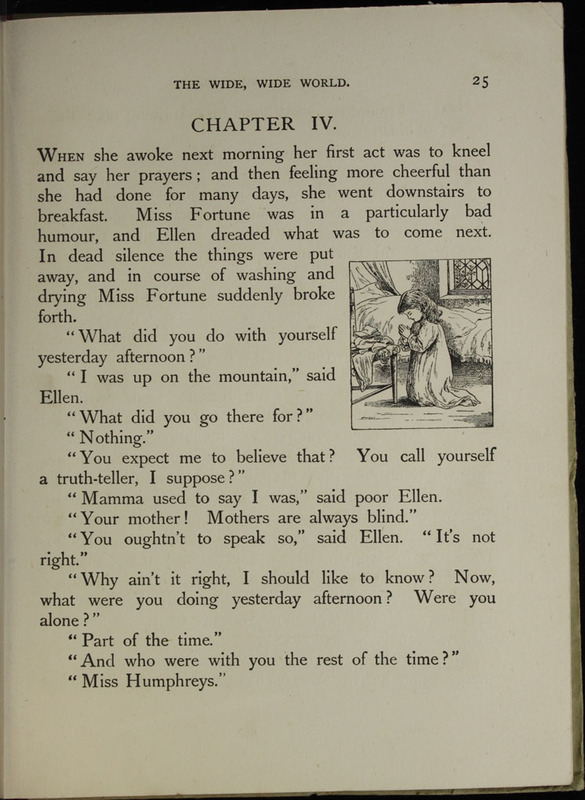 Bohn Reprint, Version 1 Depicting Mr. Van Brunt reading to Ellen at her sickbed. Ellen, dressed in a white nightgown, is staring up at Mr. Van Brunt with her head on her hand, while in bed. Mr. Van Brunt is sitting in a chair at her bedside with a book open on his lap, and is looking back at her. He is dressed in black, and has his arm resting on the table beside a bowl of food. The caption reads, "Go on please." 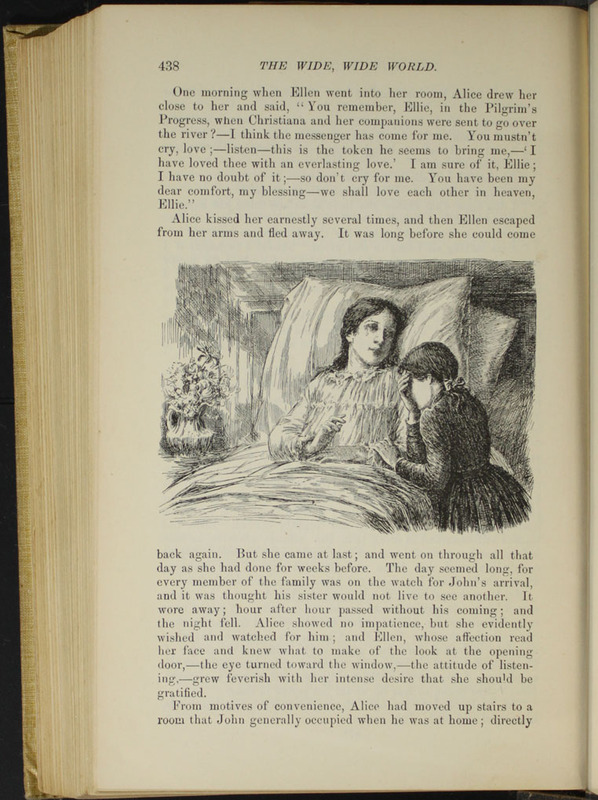 This black and white illustration, found on page 450a of the  Grosset & Dunlap reprint, depicts Ellen standing at Alice's deathbed. In the illustration, Ellen is standing inside the enclosed space of Alice's bed curtain. Ellen is placing lilies and roses that she is holding in her apron around the sleeping Alice's head. 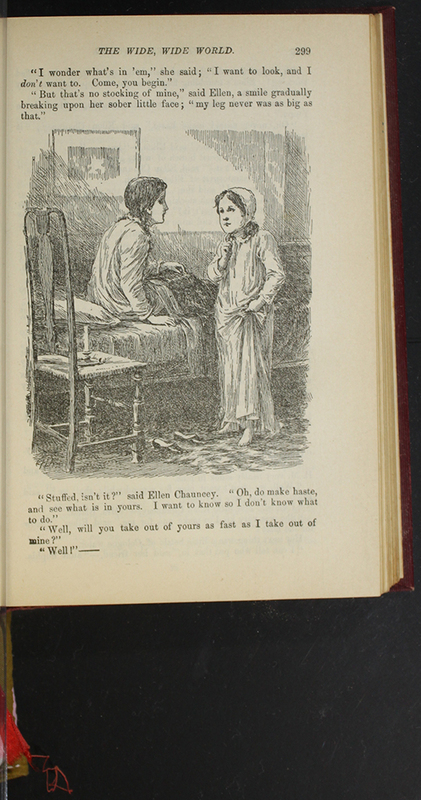 A caption below the illustration reads, "And she'd lay a rose here and and a rosebud there." The scene depicted in this illustration is on page 450.